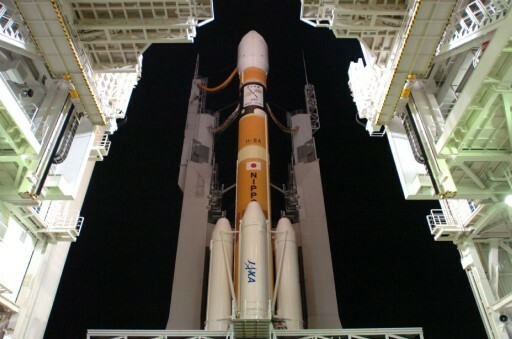 Japan’s H-IIA is on the launch pad for a rare commercial satellite launch Tuesday morning, lofting the Telstar 12V satellite to Geostationary Transfer Orbit for Canadian satellite operator Telesat. After over 40 years of launching satellites into Geostationary Transfer Orbit, this marks the first commercial communications satellite launch for Japan. The mission’s 104-minute launch window opens at 6:23 UTC and H-IIA will employ its extended mission kit on the second stage to be able to operate for four and a half hours to lift the satellite to its target orbit, reducing the amount of propellant needed by the spacecraft when making its climb to Geostationary Orbit. 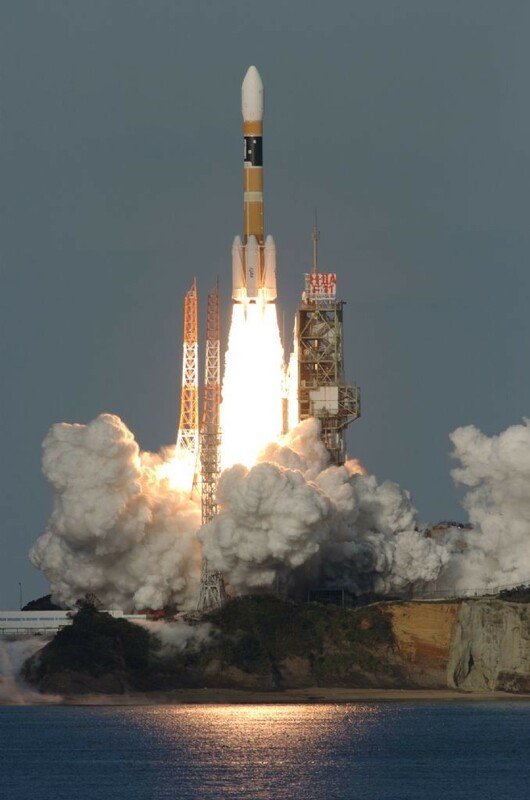 Operated by Mitsubishi Heavy Industries, the H-IIA rocket has not seen much business on the commercial launch market. However, recent years have seen a number of satellite operators placing their satellites on more expensive launch vehicles due to a shortage of available launch slots on the established launchers. Arianespace has a relatively packed launch manifest and the use of dual-satellite launches require operators to wait for a co-passenger to be ready for launch. SpaceX and the Falcon 9 rocket also have a booked launch schedule and the company is still in the process of establishing its desired launch rate. The other big name in the commercial launch business, Russia’s Proton-M, has been struggling with reliability over the past several years. These factors led to a number of satellite operators moving to other rockets such as Atlas V or H-IIA that normally see most of their business coming from government missions. 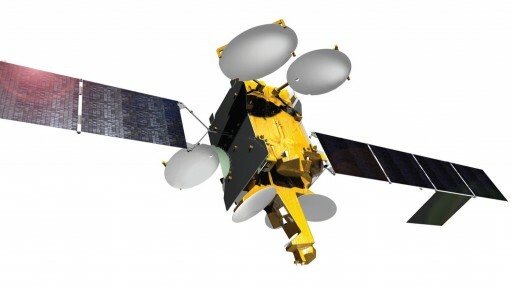 The Telstar 12 Vantage satellite was built by Airbus Defence and Space, based on the flight-proven Eurostar-3000 satellite platform. It weighs 4,900 Kilograms and generates 11,000 Watts of power for use by its communications payload consisting of 52 Ku-band – 36 MHz equivalent transponders, combining broad coverage beams and spotbeam communications to achieve flexible data services. The combination of broad regional beams and more focused high-throughput spotbeams offers enhanced performance for broadband networks on the ground, in the air and at sea. Stationed at 15 degrees West in Geostationary Orbit, Telstar 12V can deliver coverage to the Americas, Europe, the Middle East and Africa. The satellite replaces the Telstar 12 spacecraft launched in 1999 and approaching the end of its service life, utilizing 38 transponders. The additional transponders of the new satellite will be used to expand data throughout at this important orbital location and add new coverage areas in Brazil and East Africa. H-IIA Flight 29 introduces a number of modifications on the second stage of the launch vehicle to increase its flight duration in order to make it suitable for missions to what JAXA calls ‘Upgraded Geostationary Transfer Orbit’ – in essence a GTO with increased perigee as often flown to by the Proton/Briz-M and Atlas V rockets to allow payloads to reach their final Geostationary Orbit at less propellant expense. 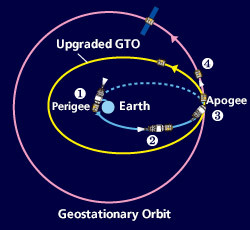 This requires a three-burn profile for the second stage – the first into a Low Earth Parking Orbit, the second after a short coast to increase the apogee to Geostationary Altitude over the equator and the third to increase the perigee and reduce the orbit’s inclination, performed at the apogee of the orbit after a four-hour coast. Introduced on the second stage are a number of modifications such as thermal insulation to reduce propellant boil-off, the capability of performing Passive Thermal Control maneuvers, more powerful batteries to handle the longer mission duration, better engine chilldown procedures and propellant settling capabilities using boiloff gases. Flying in its 204 configuration, the H-IIA consists of a two-stage stack with four Solid Rocket Boosters attached to the first stage to deliver the required kick to send the vehicle on its way to a high-energy orbit. 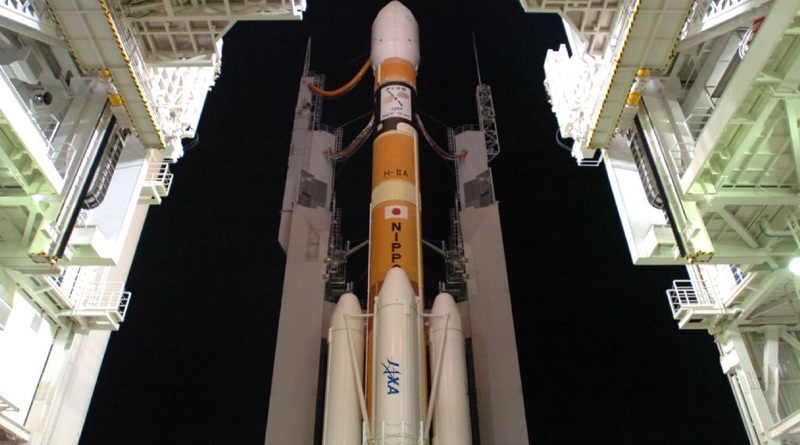 H-IIA 204 stands 53 meters tall, is four meters in diameter and has a liftoff mass of 443,000 Kilograms. It can lift payloads of up to 15 metric tons into Low Earth Orbit and six metric tons to Geostationary Transfer Orbit. Countdown operations picked up at the Tanegashima Space Center on Monday with the rollout of the rocket from the Vehicle Assembly Building to Launch Pad 1, a 500-meter trip completed in a little under 30 minutes, beginning at 22:30 local time to mark the start of a long overnight countdown. After arriving at the Pad, technicians connect data and electrical lines and put propellant umbilicals in place before completing final fueling preparations and close-outs. About eight hours before launch, teams evacuate the launch pad to get ready for the long propellant loading sequence. Beginning at about X-7 Hours and 45 Minutes, the complex propellant loading sequence gets underway with the pressurization and chilldown of ground support systems handling the -183-degree Celsius LOX and -253°C LH2. Fueling goes through a number of steps including ground support system chilldown, propellant tank chilldown and propellant loading, before tanking enters replenish mode. The propellant loading sequence takes approximately three hours until the 116,600 Kilograms of cryogenics needed for launch are loaded. Replenishing the propellants as they boil off, the tanks are kept at topping level until late in the countdown. The majority of the countdown will be spent with extensive tests of the launch vehicle’s flight control system, checks of all electronics and controllers and verifications of the radio link between the launcher and the ground. Flight Termination System testing is also performed in the early stages of the countdown. At X-60 Minutes, the Terminal Countdown Sequence will start. During the final hour of the countdown, last-minute items will be closed out and the vehicle will be reconfigured for the Automatic Countdown Sequence starting just 4.5 minutes prior to blastoff. As computers are given control of the countdown, H-IIA’s Propellant Tanks will be pressurized for flight. At X-3 minutes, the launch vehicle is switched to internal power while the satellite will have been switched to battery power ahead of the final countdown sequence. One minute before liftoff, thousands of Kilograms of water are being poured over the launch platform to suppress the acoustic loads at ignition & liftoff. Launch Vehicle Ordnances will be armed at X-30 Seconds and the Guidance System of the Vehicle is switched to Flight Mode 12 Seconds later before the sparklers underneath the LE-7A main engine ignite to burn off residual Hydrogen. Ignition Sequence Start is commanded at X-5.2 Seconds and the LE-7A Engine soars to life as the turbopumps spin up to flight speed, being monitored by on-board computers to make sure the engine is healthy before the booster ignition command is issued at T-0 – committing the vehicle to launch. At the moment of booster ignition, the H-IIA rocket leaps off its pad with a total thrust of 1,034 metric-ton-force – the two boosters delivering 89% of the total thrust at liftoff, providing the extra kick needed to send Telstar 12V on its way. 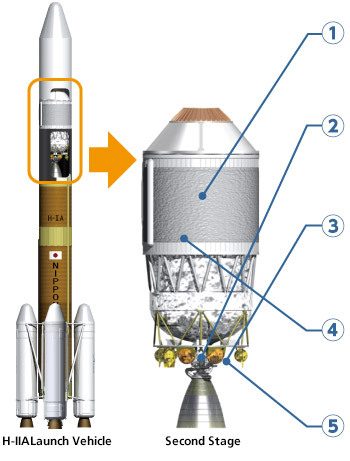 H-IIA will make a short vertical ascent before beginning to pitch and roll in order to get aligned with its precisely planned ascent path taking the launch vehicle to the south-east for a trip across the Pacific Ocean, heading to a Low Earth Parking orbit. On its way uphill, H-IIA quickly passes Mach 1 and Maximum Dynamic Pressure. The four boosters burn until T+1 minute and 56 seconds – burnout will be sensed by the declining pressure in the combustion cambers. Booster jettison occurs in pairs at T+2:07 and T+2:10 using pyrotechnics and thrust struts to ensure a clean jettison. The four SRBs help accelerate the launch vehicle to over 2 Kilometers per second and separate when the vehicle is 80 Kilometers in altitude. Powered flight continues on the LE-7A engine of the first stage alone. The engine delivers 109,300 Kilograms of thrust, burning about 260 Kilograms of cryogenics per second. By T+3 minutes and 25 seconds, H-IIA will have reached an altitude of 150 Kilometers making it safe to jettison the Payload Fairing as aerodynamic forces can no longer harm the spacecraft. Separating the fairing as early as possible increases ascent performance as additional weight is lost at fairing separation. Flight 29 is the first to use the 4S fairing model to fit the size of the Telstar 12V satellite. 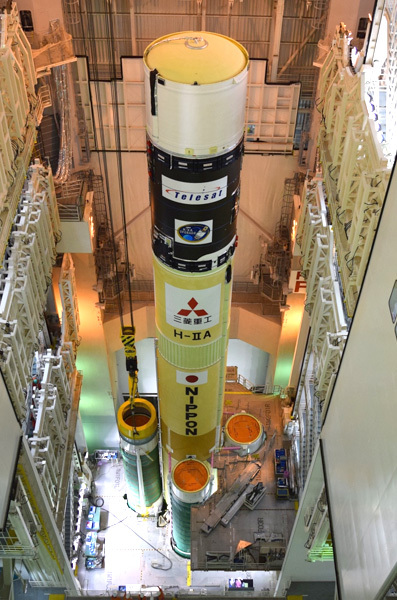 H-IIA’s first stage will burn until T+6 minutes and 40 seconds, accelerating the launch vehicle to 6.1 Kilometers per second. Shutting down its LE-7A engine, the firs stage is separated at T+6:48 at an altitude of 245 Kilometers and the second stages prepares for its first burn that is planned to begin six seconds after staging. Achieving its full thrust of 13,970 Kilogram-force, the second stage will burn its LE-5B engine for four minutes and 23 seconds to boost the stack into a slightly elliptical Low Earth Parking Orbit. 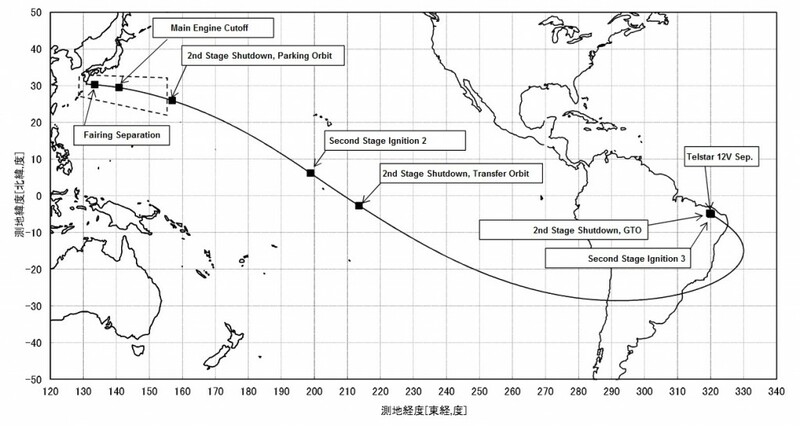 Next will be a short coast phase of 11.5 minutes during which the vehicle continues its south-easterly trek in order to reach a position near the equator to center the burn around the equator passage which positions the location of the orbit’s apogee over the equator as well – standard practice in GTO launches. The second burn begins at T+22:46 and has a planned duration of three minutes and 51 seconds to boost the vehicle’s velocity by 2.5 Kilometers per second. Cutoff on the second stage is expected at T+26:37. The stack will then enter the long coast phase needed to climb to the apogee of the orbit that is located slightly shy of Geostationary Altitude. During the coast, the modified second stage will use boiloff gas from the cryogenic propellant tanks for propellant settling and conduct a Passive Thermal Control roll maneuver to evenly distribute sunlight on its surface to avoid thermal gradients. Re-start of the LE-5B engine is expected four hours, 22 minutes and 45 seconds into the flight on a burn of only 46 seconds, raising the perigee of the orbit and reducing the inclination. Spacecraft separation is expected at T+4:26:56 at an altitude of 33,900 Kilometers.